We live in a society where happiness is golden, and therefore the heart is King. From the very first days of our childhood we are taught to protect our hearts and to stay away from anything or anyone who may potentially hurt it. From the beginning of my childhood, I was told to stick with people who share the same morals, and ethics. This is common practice in most religions, and thus the reason most religious people stick together. It is all in the pursuit to reduce the risk of damaging our precious heart, and facing any pain what so ever. To be honest, this protecting of the heart led to an extremely sheltered life. All my friends were minnie clones of me, and I lived an extremely stable and happy life. Everything was controlled, predictable, and extremely stable. I never cried and I was ridiculously happy, and according to society standards, this is the “ideal” way to live. However, I stand here broken to bits by a shattered heart and can honestly say, my heart works better after heartbreak. If you have followed my blog, you would know that the person I fell in love with, is as opposite as could be. He taught me the irony in loving someone who is completely my opposite who in many ways is my reflection. The fact that he was an atheist and I am highly spiritual created massive disagreements. Our values were too different and the only thing that bound us together was love. The clash of beliefs left both of us bruised and beat up, throughout the years, but I can say for myself, he taught me more about life than anyone else. During the relationship I bitterly rejected his beliefs simply because they were so different to what I believed. However, now as i look back, some of the things I miss most about him was all our late night debates on religion/politics/life. He really widened my perspective on how different people think and believe, and how and why they believe what they do. It is painfully obvious to me now how, limited my perspective and beliefs were knowing only people who thought exactly like me. In the end my heart was broken and it did not end as fairy tales promise. However, the lessons I learned are far more precious than all the happily ever afters that could have happened. My heart in its pains, actually feel life deeper. I cry from a deeper place, and appreciate life with humility. I am grateful. I am more aware that every wonderful experience will always have an end, and thus the importance lies in savoring and appreciating of every moment. Every day I live in LOVE. It may not be the kind of “love” that society talks about where you have someone who loves you back and returns your love back to you. The love I have, is the kind you give. I don’t expect anything back, simply because that is not the kind of love that interests me. You can’t imagine how much you free your heart from heart ache and disappointment when you stop expecting people to return it somehow. Everything we believe about the heart is false. 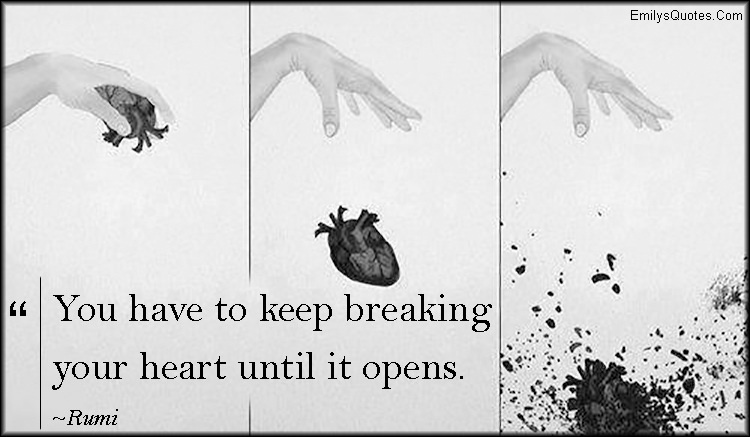 The heart grows stronger through pain, and every time it breaks it forces you to FEEL and to LIVE through LOVE. It is human nature to want to avoid any inconvenience or slight discomfort, and it only makes sense through our own ignorance, that we would want to avoid learning anything that causes discomfort. Never let ignorance lead your life, and shelter yourself from actually living it. Well put and very thoughtful . To love is enough sometimes…to expect it back is sometimes not feasible but that does not take away from the beauty of that love. BUT OH SO TENDERLY TRUE WORDS.